The city of Paris was renovated between 1853 and 1870 under Emperor Napoleon III. Baron Haussmann teared down old buildings to make more space for a cleaner and safer city. The Franco Prussian War required reconstructing parts of the city that were destroyed. Employing their new style to represent its wide boulevards, public gardens, and grand buildings. Pissarro and Gustave Caillebotte enthusiastically painted the city. 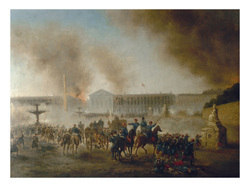 The Franco Prussian War explosion of population gave the artists a big amount of material for their scenes of urban life. Caillebotte focused on the working class and other impressionist artists like Beth Morisot, focused on the privileged classes.